Grilled Romaine hearts add a fantastic layer of flavour to this Caesar salad. 1. In a mortar and pestle, mash garlic clove and salt down into a rough paste. Add chopped anchovies and continue to pound and mix until smooth and combined. Add yolk and mustard and continue to combine with a circular motion inside the mortar. Using pestle to evenly mix, slowly stream in olive and vegetable oil, taking care to incorporate each addition of oil before adding more; at this stage you should have a glossy, thick consistency. Finally add the Parmesan and stir in the lemon juice and pepper - the dressing will slightly loosen up, which is just right. Transfer the dressing to a small bowl and cover with plastic wrap, refrigerate, until ready to use. 1. Preheat a grill pan or outdoor grill to high heat. 2. Prepare romaine hearts; trim bottom stems slightly, keeping base intact and remove any blemished outer leaves. Slice each romaine heart in half lengthwise, to form 4 identical pieces. 3. In batches, place each romaine heart, cut side down, onto hot grill over direct heat if cooking on an outdoor grill. Press down slightly and let char marks form, about 1 minute. Remove from heat and set aside to cool down, cut side up, on a clean dry tray. 4. To assemble, for each serving; place one piece of grilled romaine, charred side up, on serving dish. Season lettuce with a drizzle of extra virgin olive oil, salt and pepper. Spoon Caesar dressing over and around the lettuce, about 2 tbsp per serving. Finish with a pinch of red chili flakes and cheddar crisps. Serve right away. 5. Any remaining Caesar dressing can be stored in an airtight container, refrigerated, for 3 days. 1. Heat a small non-stick pan over medium high heat. To hot pan, add 1/4 cup grated cheese in a round, even shape, about 3 1/2 to 4 inches in diameter. Do not disturb, and let cheese melt and sizzle away for about a minute. Stay close by; the edges of the cheese will start to turn a very light golden, and the bubbling will start to slow down as the moisture in the cheese starts to cook away, another 20-30 seconds. As soon as the edges start taking on a golden colour, using a small palette knife quickly transfer the whole round over to a paper towel lined tray. (The frico will be slightly pliable while it is hot.) Repeat with remaining cheese, making 4 rounds in total. 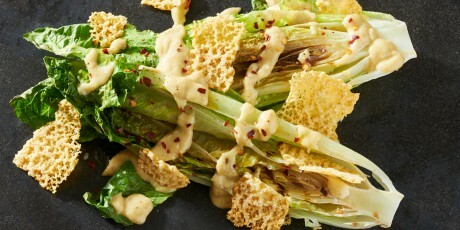 Let crisps cool completely and serve with the Grilled Caesar Salad.